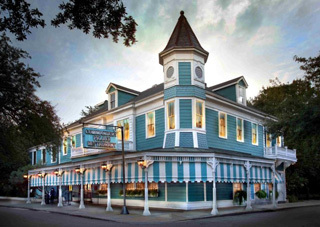 The award-winning restaurant Commander's Palace, located in the Garden District of New Orleans, Louisiana, and steps away from the historic St. Charles Avenue Streetcar line, has been a grande dame of New Orleans fine dining since 1880. Enter the landmark turquoise and white Victorian building and you feel like you are entering another time. 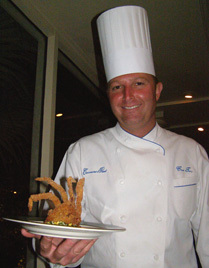 Executive Chef Tory McPhail is the creative talent in the kitchen who enjoys keeping things fresh. Commander's Palace is a restaurant made for celebrations, of course, this being New Orleans, celebrations do not have to be something big like an anniversary or a birthday, a celebration in New Orleans could be as ordinary as the fact that it is a Wednesday and the weather is perfect. In other words, Commander's Palace is a restaurant where it is all about living and reveling in the good life, something to which I aspire to achieve each day. 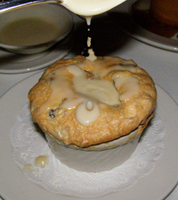 During our visit to New Orleans in July 2011, Edward F. Nesta and I had an excellent dinner at Commander's Palace, a place that we continue to return to as often as we can for the cuisine, as well as the ambience, and for the long-standing service by the venerable wait staff. The ambience is romantic yet fun, with white linen draped tables accessorized with glass candlesticks with gold beaded shades, recessed lighting, and leopard print carpet. 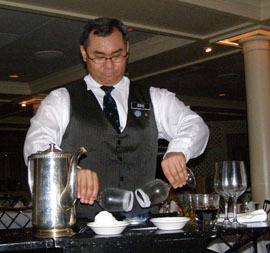 There is an inspired cocktail menu to complement the restaurant's 2500 wines on their extensive wine menu, which received the Wine Spectator, Best of Award of Excellence 2010. They also offer many wines by the glass perfect for pairing wines with each course, and we celebrated the beautiful summer evening in New Orleans with a glass of their signature 2004 Commander's Palace Cuvée Brut by Iron Horse, Russian River Valley, California. 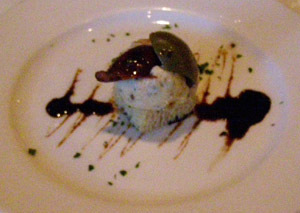 Executive Chef Tory McPhail began our evening with a tasty amuse bouche of a crostini topped with goat cheese, drizzled with reduced balsamic, and garnished with a green and niçoise olive that whetted our appetites. The second "greeting" of the evening was extremely tender, bacon-crusted oysters served with grilled sweet corn that had just a hint of bacon that gave the dish its slightly smoky and spicy flavor. 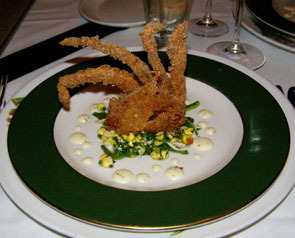 Next, there were Soft Shell Crabs, which Chef Tory had caught that afternoon, lightly dusted with cornmeal and sautéed, that melted-in-your-mouth, and if they were any fresher, we would have needed to eat them standing in the water. The crab was well paired with a 2008 LIOCO Chardonnay, Durell Vineyard, Sonoma Valley, California with its earthy, mineral and slate notes, with stone fruit and white peaches and a honeyed sweetness on the nose, with a hint of oak on the palate. 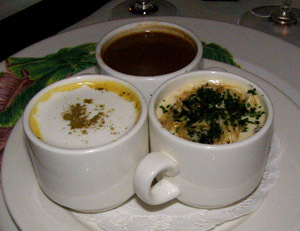 We continued with their Soup 1-1-1, a delicious sampling of three different 2-ounce soups served in demitasses. For Edward, there was gumbo, their signature turtle soup, and their soup of the day that celebrated the Creole tomato season made with heirloom tomatoes and Louisiana sweet corn. 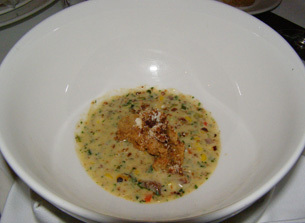 For me, there was shrimp and okra gumbo, dark, rich, and laden with shrimp; delicate soft shell crab bisque; and an outstanding sweet corn and crab velouté that I graciously allowed Edward to sample. Edward continued with a main course of Veal Chop Tchoupitoulas, which was a Creole spiced chop of milk-fed veal presented over goat cheese stone-ground grits with asparagus, and classic green peppercorn demi-glaze. 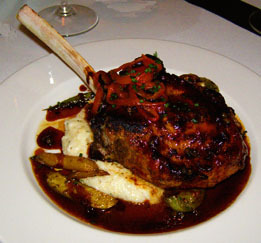 The chop was paired with a 2007 Mongeard Maigneret Echézeaux Grand Cru, Burgundy, France. For my main course, there was a delectable Creole Tomato Butter Poached Gulf Hake that was grilled and presented with lump crabmeat, baby gulf shrimp, and a sweet corn sauce with carrots and lima beans, paired with a 2007 J.M. Boillot Puligny, Montrachet, Cote d'Or, Burgundy, France. 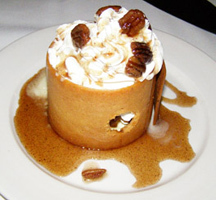 Desserts are de-rigueur in New Orleans, and we sampled their praline parfait with crunchy pecans and crème Chantilly; the bread pudding soufflé; and the crème brûlée, presented in a large shallow bowl to maximize the brûlée, which had a large confectionary sugar fleur-de-lis, the symbol of New Orleans. 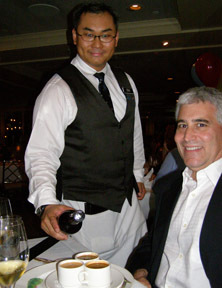 As a stunning grand finale to the evening, Eric, our server and sommelier who has worked at the restaurant since 1997, created Café Pierre for us tableside, which was a lovely mélange of coffee, brandy, Galliano, and Kahlua presented in snifter glasses. As always, dining at Commander's Palace was a night of celebrations, even if it was only a beautiful Wednesday summer night. Commander's Palace serves dinner from Monday through Sunday from 6:30 pm until 10:00 pm; lunch from Monday through Friday from 11:30 am until 2:00 pm. There is a Jazz Brunch featuring a special menu and Live New Orleans Jazz by the Joe Simon's Jazz Trio on Saturday from 11:30 am until 1:00 pm, and on Sunday from 10:30 am until 1:30 pm. Business Casual attire is acceptable, jackets preferred at dinner. No shorts or t-shirts accepted at any time. Read about Commander's Palace in the Chefs' Recipes section where Executive Chef Tory Phail shares his recipes for Bourbon Lacquered Quail, Lady Apple and Foie Gras Stuffed Quail, Bacon Braised Cabbage and Persimmon Jam with Basil Hayden Bourbon-Molasses Glaze; Creole Cream Cheese Gnocchi with Crawfish, and Grilled Wild Boar Chops with Southern Comfort Apricot Glaze. Bon Appetit! Read about "In the Land of Cocktails, Recipes and Adventures from the Cocktail Chicks by Ti Adelaide Martin and Lally Brennan" of the Commander's Palace Family of Restaurants in the Luxury Products - Gifts section. Read other articles on the Tales of the Cocktail and New Orleans in the Destinations, Hotels and Resorts, Restaurants, Chefs' Recipes, and Liquor Cabinet sections. For information on Tales of the Cocktail, please visit: www.TalesoftheCocktail.com. 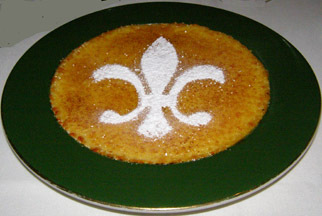 For information on New Orleans, please visit: www.NewOrleansCVB.com. © September 2011. Luxury Experience. www.LuxuryExperience.com. All rights reserved.